Jane Addams shown in front of the backdrop of Hull House and a group of her fellow female peace activists. 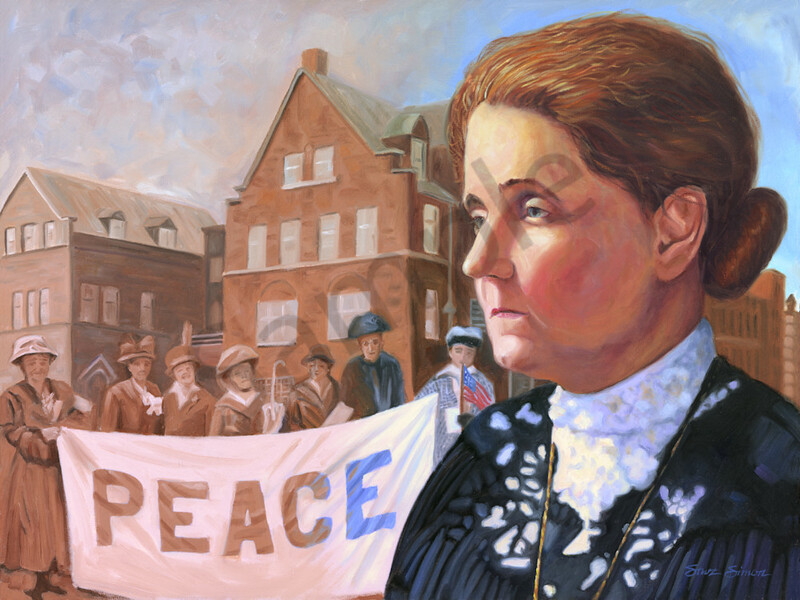 Jane Addams was known as the "Mother of Social Work." She received international recognition as a social worker, reformer, and philosopher in the early twentieth century. Addams was a committed peace activist, feminist, and humanitarian. She was the first American woman to receive the Nobel Peace Prize. At the age of twenty-nine, Addams co-founded America’s first settlement house in Chicago. Hull House provided services for the poor and immigrant population in the area. The facility eventually grew to include more than ten buildings, offering an impressive array of social programs. Meanwhile, Addams campaigned tirelessly on a remarkable breadth of local, national, and international issues and became a frequent lecturer on peace. At the outset of World War I, Addams became chair of the Women's Peace Party. She founded the Women’s International League for Peace and Freedom in 1919, working in vain for many years to convince the world’s powers to disarm and commit to peace. After World War I, Addams was critical of the Treaty of Versailles, predicting that its humiliating demands would lead to yet another war.